Hair colour for men is one of the simplest ways to change your look instantly. At Element Hair, we’ve been seeing an emerging trend in Men’s Colour, specifically targeting services to suit whatever look you’ve always wanted to try out! We offer a multitude of different services in order to help you create your desired look. This blog post will discuss all of the colour options we have for Men’s Colour to cater to whatever trend you’d like to test out! A trend we love is grey hair! Men are more comfortable sporting their grey hair now more than ever. At Element hair, we love the salt and pepper look! 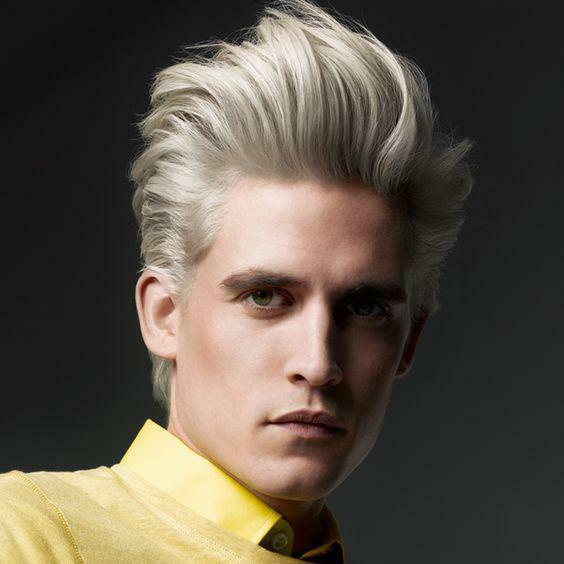 One of our favourite ways to enhance your style when sporting your grey hair is to add dimension with lowlights. Men’s Lowlights are colour strategically placed to create fullness in the hair. They’re always darker in tone than your natural colour in order to add depth to the overall look of your hair. This is easily the most low maintenance colour for our clients who want a change without the fuss of coming back before their next haircut. Goldwell Pixelation Service demonstrates what lowlights can do for your hair, adding depth and dimension to your look for fuller looking hair! Another service we offer for salt and pepper hair is the Goldwell Men’s Reshade service. Reshade is all about a fresh look – it works by tinting your hair to a darker shade and blending any grey hairs so they look softer and more youthful. Reshade offers a visibly fuller look to the hair and is a quick 30 minute service. 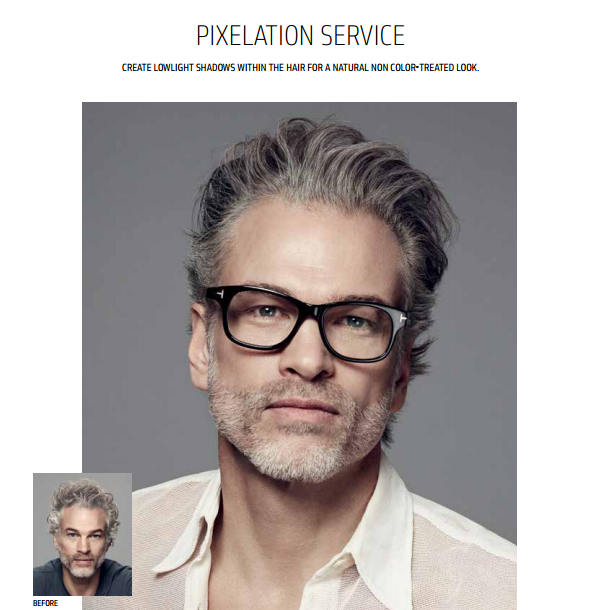 Goldwell* Men Reshade – cool and effortless – the look is all about blending grey! For men who want to dip their toes into colour services, we offer three different highlighting techniques to add a touch of brightness to your look. Highlighting is about bringing lighter pieces to the hair – this service is usually for clients with deeper hair colours (think black, dark brown, even medium brown hair) who want to bring out the shape of their haircut. Darker hair colours sometimes look flat because light gets absorbed into darker palettes. Highlighting is perfect for accentuating the shape of your hair and bringing the focus of attention to the look of the hair. Cap Highlights – Perfect for clients who rock shorter styles, this old-school technique is still perfect for adding lighter pieces to your hair. Foil Highlights – Perfect for clients who rock medium-long styles, this technique brings your look to another level with accent pieces that are strong, piecey, and cool. Balayage Highlights – Perfect for clients who rock medium-long styles, this technique is on trend to bring you a range of soft sun-kissed hair to strong bold pieces of colour. It offers a seamless transition from your natural colour to the fashion shade of your choice. For all highlighting services, we recommend a Glaze. Lightening your hair will almost always result in Justin Timberlake circa 2000 instant noodle yellow. A glaze is a colour that will shift the tone of the hair to suit whatever look you want. Glazes come in all kinds of shades, ranging from natural caramels, dirty blondes, chocolates to fun and on trend fashion shades – think all colours of the rainbow! Goldwell Imagery – Natural Balayage Highlights to bring out the texture and movement of the cut. Goldwell Imagery – Strong cool blonde accent highlights to complement shape and structure. For men who want to make a statement with their hair, we also offer Men’s All-Over Colour services. This is for men who are interested in taking their look to the next level, completely changing their hair colour from their natural colour. All-over colour is perfect for clients who don’t want to see any grey in their hair, or for clients who want a complete change in their hair colour. All over colours are best for men who want to deepen their hair colour or go slightly lighter with their look. Our all time favourite trend for this year is silver fox shades. We’ve been seeing this look everywhere from social media to celebrities like Justin Bieber, or infamous athlete Ryan Lochte. Despite their infamous behaviour, we can’t help but admire their hair colour. Cool shades of silver are on trend and here to stay. The way to achieve this look is with an Men’s All-Over Bleach, which requires us to lighten your hair to a blinding Eminem circa 2000 yellow blonde. The process is finished with a glaze that shifts your hair to the cool silver fox hair look that is poppin’ for this year! This service is also available for every fashion colour you can imagine, from deep teals to cool violets. Goldwell ColorZoom image: Cool Blonde Glazed All-Over Bleach Look. With all of the colour services we offer, we do recommend that you come in for a consultation. 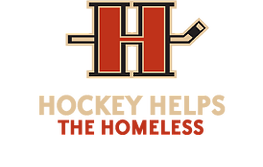 Consultations are completely complimentary and are a short 15 minute service. If you’re ever curious about changing your look with some colour, your stylist will be more than happy to talk colour options with you during a haircut service too! We love men’s colour, and are so excited to see that it’s becoming a more common service! We’re always on the lookout for new trends and are constantly educating ourselves to see what trends will be coming to serve you better! Some of the cool fashion shades our clients love rocking! Done by various stylists at our salon. Book an appointment online or call Element Hair today at 519-746-1212.